On February 7 2014, Trier's Public Library hosted an evening honoring Alice Munro. The event was organized in cooperation with the Trier Center for Canadian Studies and the IRTG Diversity. Alice Munro had already been awarded numerous prizes such as the prestiguous Giller Prize, the Canadian Governor General's Award and the Booker Prize when she was chosen as the first Canadian recipient of the Nobel Prize for literature in December 2013. She is a master of the short story. In her texts, the ordinary and the extraordinary are woven into rich (quotidian) tapestries that often open readers' eyes to unexpected insights. 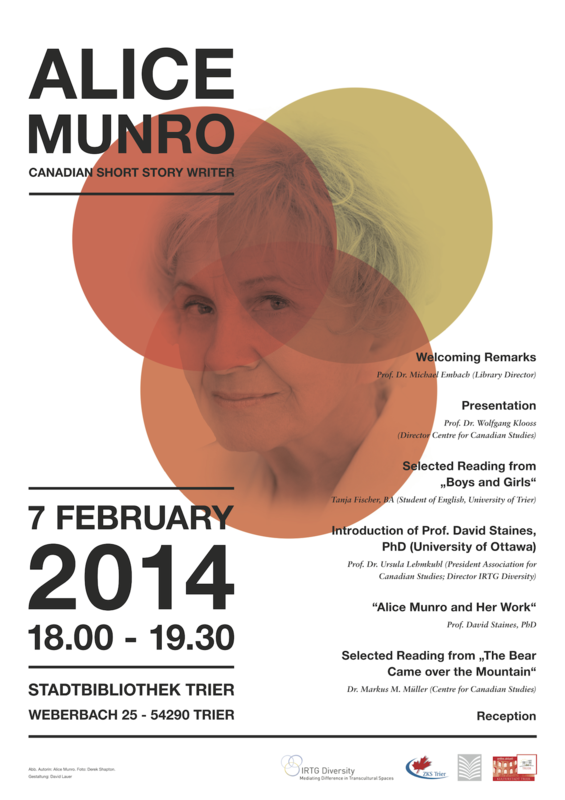 The Alice Munro evening at the Trier Public Library featured an introductory lecture on the author and her work by Prof. David Staines (U of Ottawa) and readings from the short story "Boys and Girls" and "The Bear Came over the Mountain".